What is a Fifth Metatarsal Fracture? Avulsion fracture. In an avulsion fracture, a small piece of bone is pulled off the main portion of the bone by a tendon or ligament. This type of fracture is the result of an injury in which the ankle rolls. Avulsion fractures are often overlooked when they occur with an ankle sprain. Jones fracture. 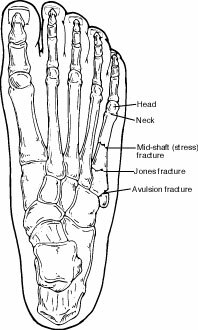 Jones fractures occur in a small area of the fifth metatarsal that receives less blood and is therefore more prone to difficulties in healing. A Jones fracture can be either a stress fracture (a tiny hairline break that occurs over time) or an acute (sudden) break. Jones fractures are caused by overuse, repetitive stress, or trauma. They are less common and more difficult to treat than avulsion fractures. Other types of fractures can occur in the fifth metatarsal. Examples include mid-shaft fractures, which usually result from trauma or twisting, and fractures of the metatarsal head and neck. Anyone who has symptoms of a fifth metatarsal fracture should see a foot and ankle surgeon as soon as possible for proper diagnosis and treatment. To arrive at a diagnosis, the surgeon will ask how the injury occurred or when the pain started. The foot will be examined, with the doctor gently pressing on different areas of the foot to determine where there is pain. The surgeon will also order x-rays. Because a Jones fracture sometimes does not show up on initial x-rays, additional imaging studies may be needed. Rest: Stay off the injured foot. Walking may cause further injury. Ice: Apply an ice pack to the injured area, placing a thin towel between the ice and the skin. Use ice for 20 minutes and then wait at least 40 minutes before icing again. Compression: An elastic wrap should be used to control swelling. Elevation: The foot should be raised slightly above the level of your heart to reduce swelling. Immobilization. Depending on the severity of the injury, the foot is kept immobile with a cast, cast boot, or stiff-soled shoe. Crutches may also be needed to avoid placing weight on the injured foot. Bone stimulation. A pain-free external device is used to speed the healing of some fractures. Bone stimulation, most commonly used for Jones fractures, may be used as part of the treatment or following an inadequate response to immobilization. If the injury involves a displaced bone, multiple breaks, or has failed to adequately heal, surgery may be required. The foot and ankle surgeon will determine the type of procedure that is best suited to the individual patient.